Wedding ceremonies are one of the most memorable events in a couple’s life of being together. It is the day that they have longed for, it is the day that they will officially be bonded by marriage and finally call themselves as husband and wife. As much as possible, weddings are kept personal and private with only the family members, the closest relatives and friends being in attendance, and this is why it is important to make use of invitations. 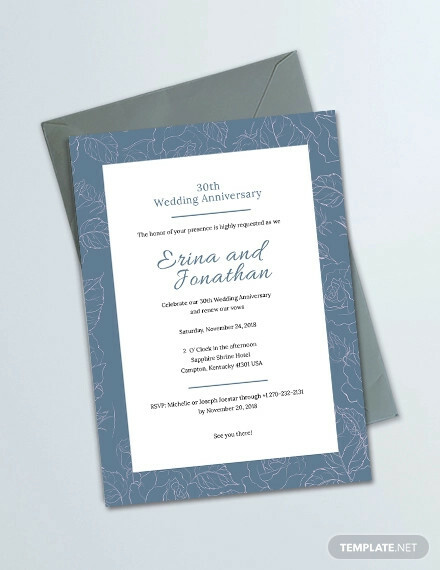 Wedding invitations, for one thing, can be used by the wedding organizers and planners as a way of controlling the number of people in attendance. With invitations, only those that were being given a copy of it are allowed (or at least formally allowed) to attend it. 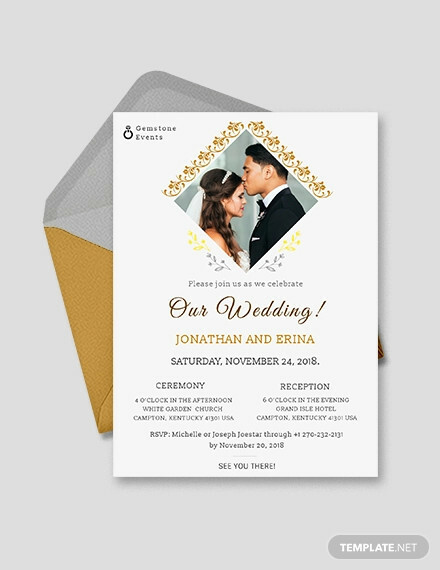 On this website, we have gathered around (45+) of the best and most appealing wedding invitation designs that you can download. Check them out below. First up, check out this creative and colorful wedding invitation card design that is inspired by hand-drawn watercolor paintings. 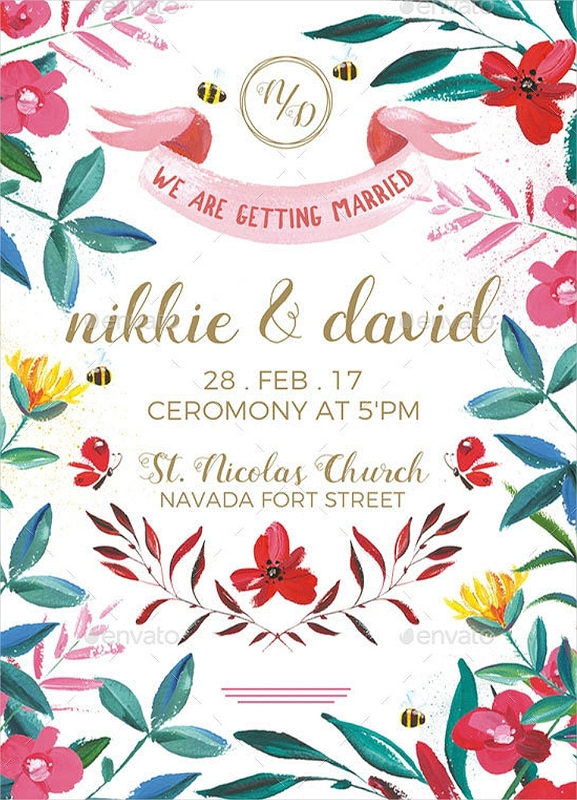 In the middle area of this design is where you can find the relevant information about the wedding, and is surrounded by hand-drawn illustrations of plants as well as insects. 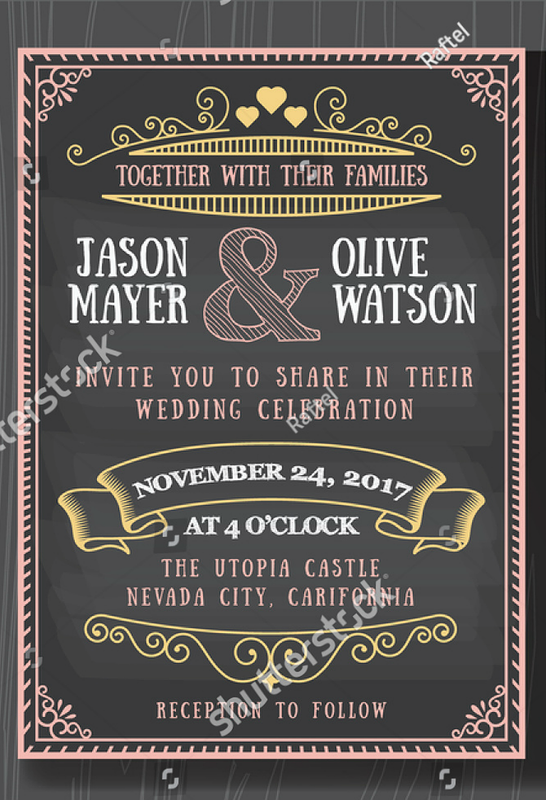 Here is an example of a beautiful rustic wedding invitation design that involves mostly text with only a few creative elements added to enhance the appearance of the design. To keep this design from looking cluttered, it maximizes its use of white space, which is also good for emphasizing the text included on the design. 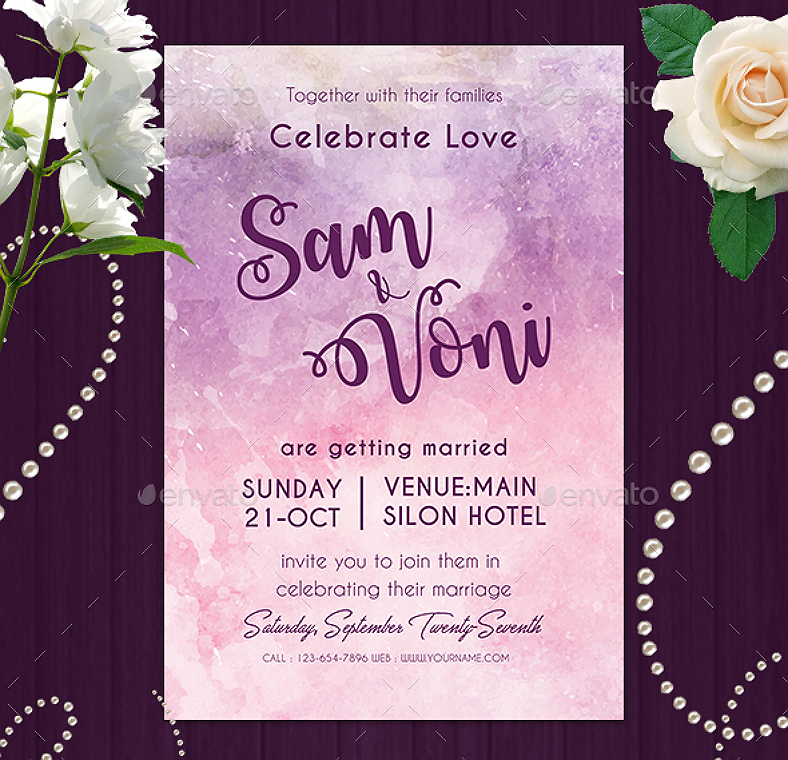 Download this design for a modern touch on wedding invitations in which the lower half is used to write down the necessary details that the invitee needs to know, and the upper half can be used for adding your own image. While any image of the soon-to-be-wedded couple may be enough, the best one to use here should be taken from the couple’s prenuptial pictorial. For a unique approach on ceremony invitations for wedding, this one may be a very good choice since it reflects our modern generation as evidenced by the smartphone appearance. 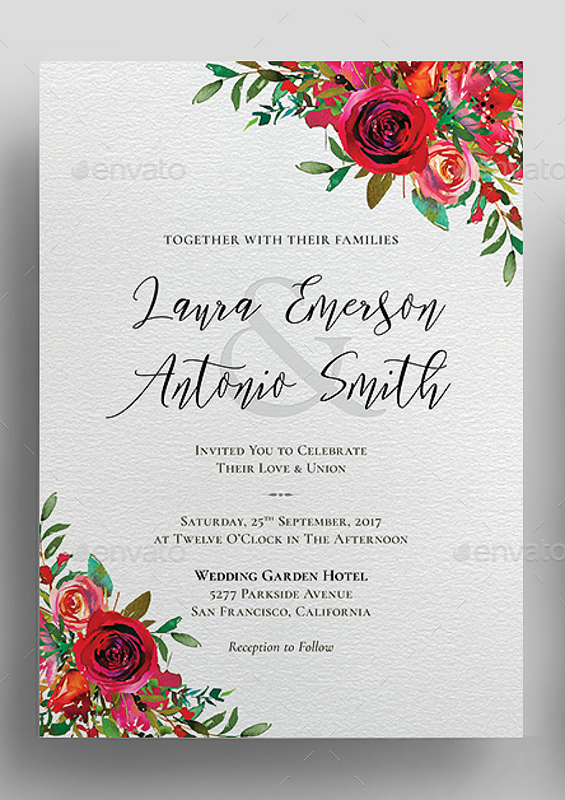 The image of the smartphone on this wedding invitation only serves as the border, and the design within it is where the important features can be found, which includes some floral designs and the typography that indicates the details about the wedding. 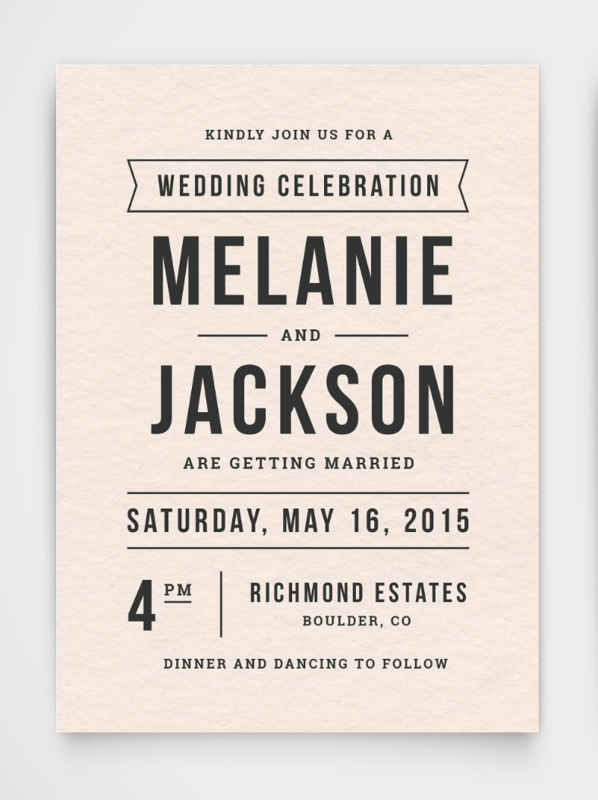 Here is another wedding invitation that divides the design into two equal parts. The upper half is where the image of the couple is seen, and you can use whatever photo there is as long as it fits appropriately to the theme of the invitation and to the wedding itself. For an added dramatic and cinematic effect to the couple’s photo, you can desaturate it or convert it to grayscale. 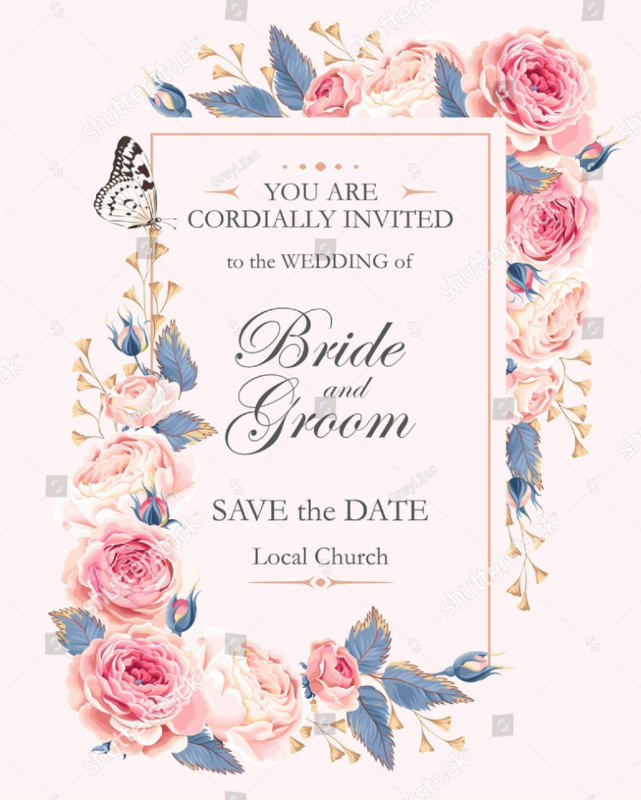 On the lower half of the invitation design is where the information about the wedding is located, and these are being arranged in an organized manner to avoid confusion on the part of the invitee. Sometimes, you don’t really have to incorporate too many colors just to make a design look visually attractive, you only need to make use of at least two contrasting colors that are able to compliment each other. 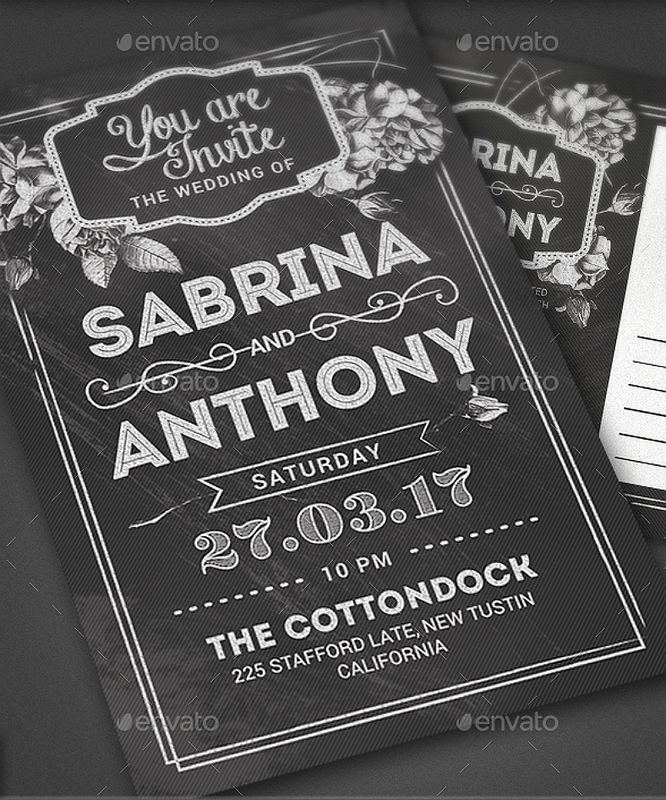 In this case, the colors involved are black and white, which gives the design both a retro and a chalkboard effect. 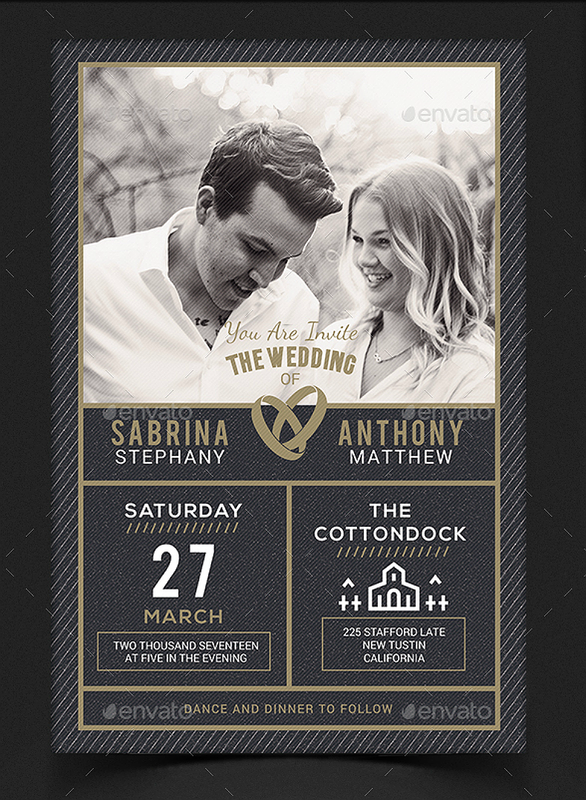 If you want to keep your wedding invitations simple, then download this design. If you want to go unconventional, then this will be a perfect choice. 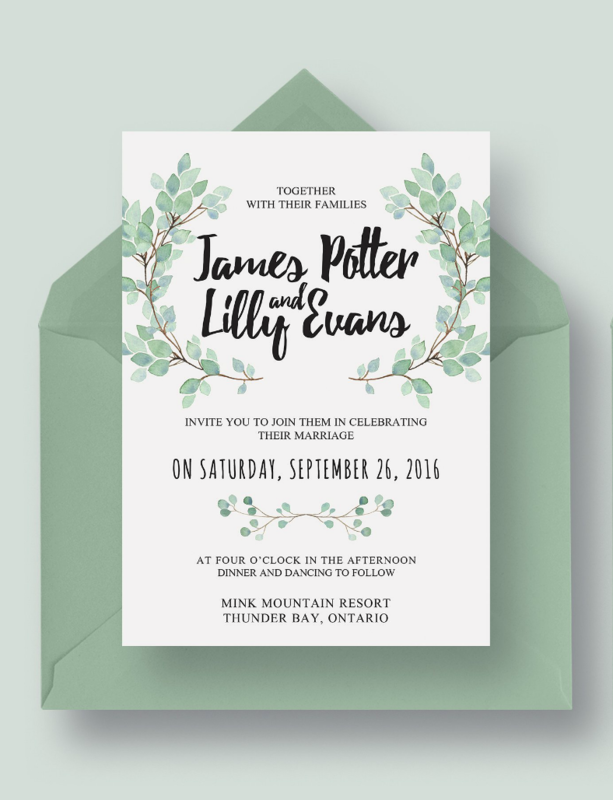 Most wedding invitations come in a flyer or a letter format, but why stick to the traditional style when you can come up with something unique? 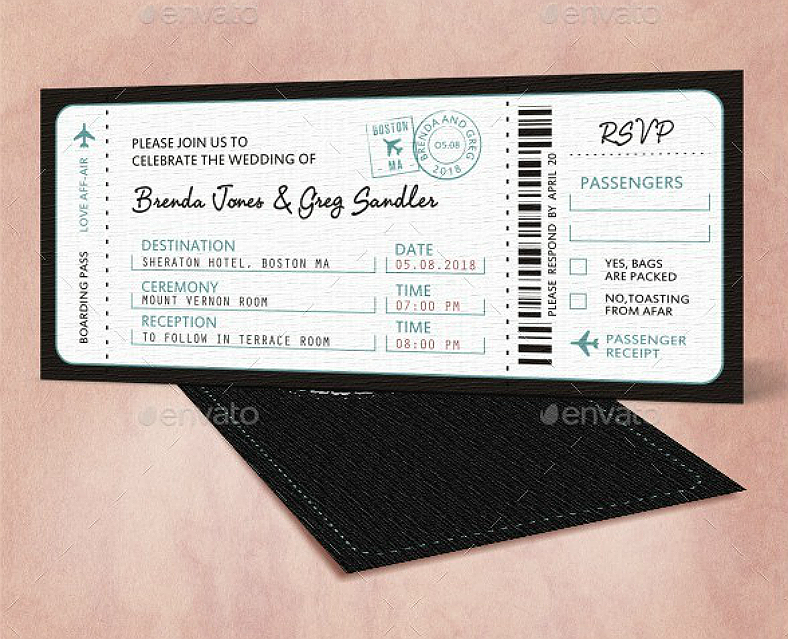 Make your wedding invitations look like boarding pass tickets and this, itself, will be a memorable feature to the wedding. 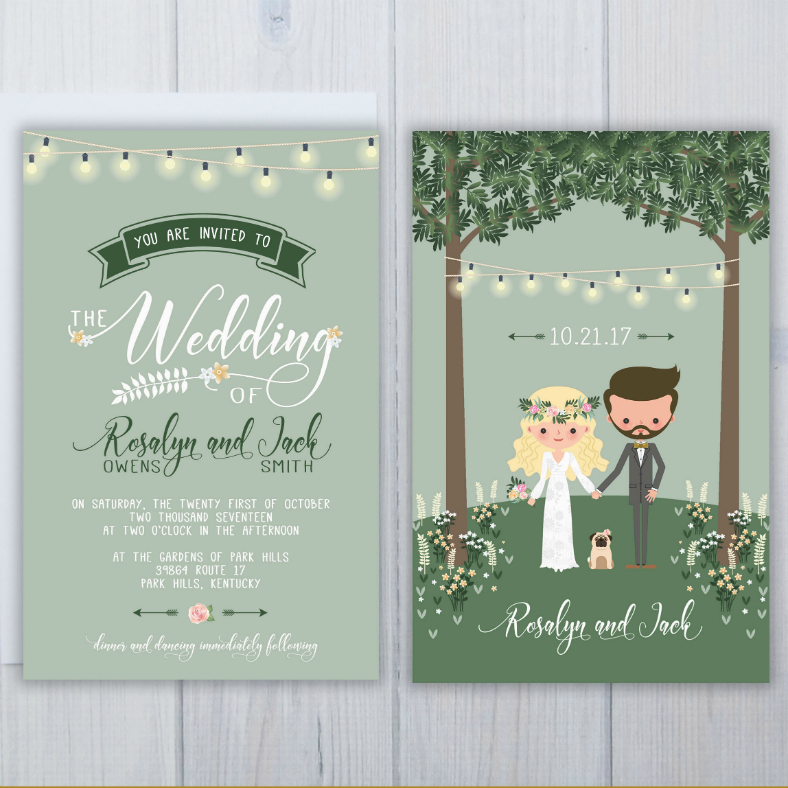 If you want something that is a bit on the simpler side, then download this cute and attractive wedding invitation design. This design focuses more on the calligraphic and handwritten-inspired typography, with some added leaf stems decorated around the sides to provide visual enhancements to it. This layered invitation design includes two distinctive features that are able to compliment each other to make the design attractive. The back layer bears illustrations of plants that seem to appear like they were hand-drawn with the use of a pen as evidenced by the shadings done by single-stroked lines. On the foreground is another layer where the relevant details of the wedding are indicated, and the background of this layer has a slightly opaque appearance so that the illustrations on the back layer can still be appreciated. Here is a colorful and luxurious wedding invitation design that may be a perfect choice if you are planning a luxurious ceremony as well. 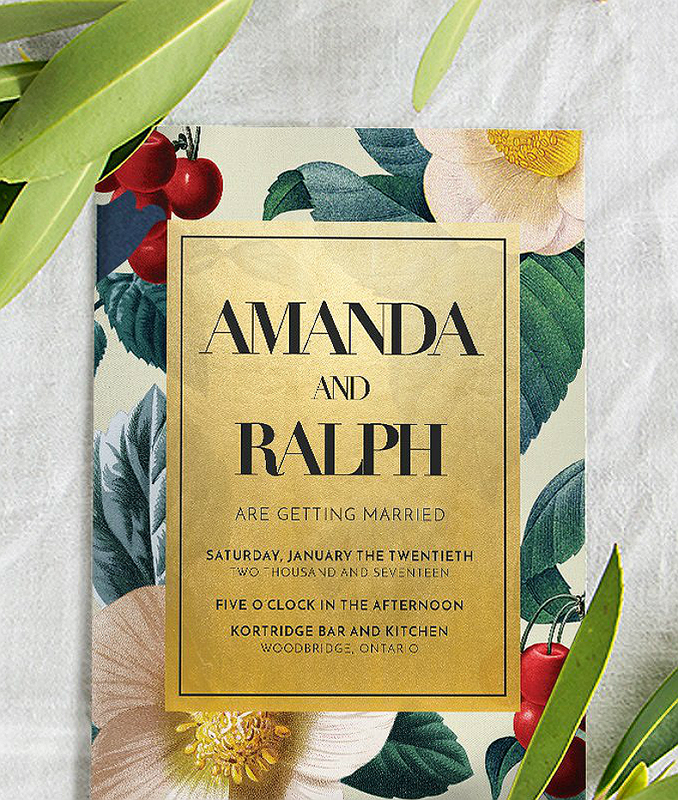 The background on this design shows a textured illustration of flowers and leaves, and even some cherries to symbolize a fruitful future for the soon-to-be-married couple. 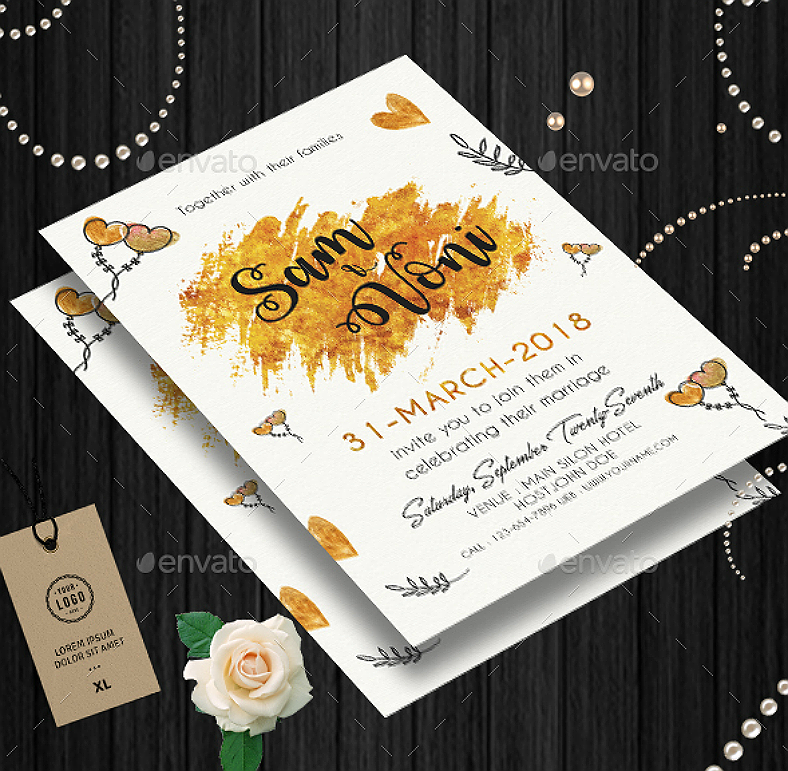 Over these illustrations is a gold, textured emblem where the names of the couple are written as well as the other necessary details that the invitee will need to know about the wedding. 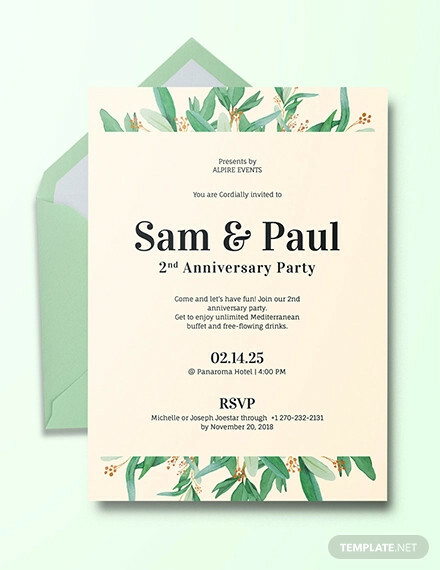 For a textured illustration of plants that is hand-drawn yet also photo-realistic on a wedding invitation, then this may be the design that you are looking for. 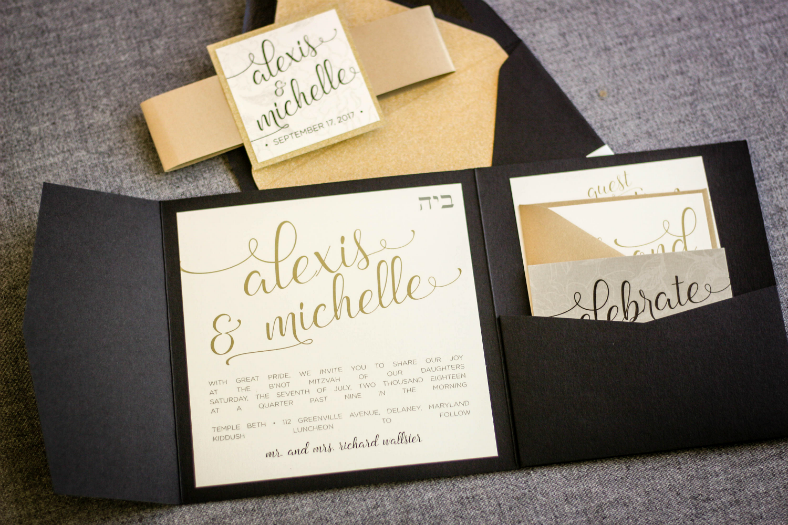 The typography on this design appears handwritten as well to give the overall wedding invitation a more personalized essence, which may make it more visually appealing. 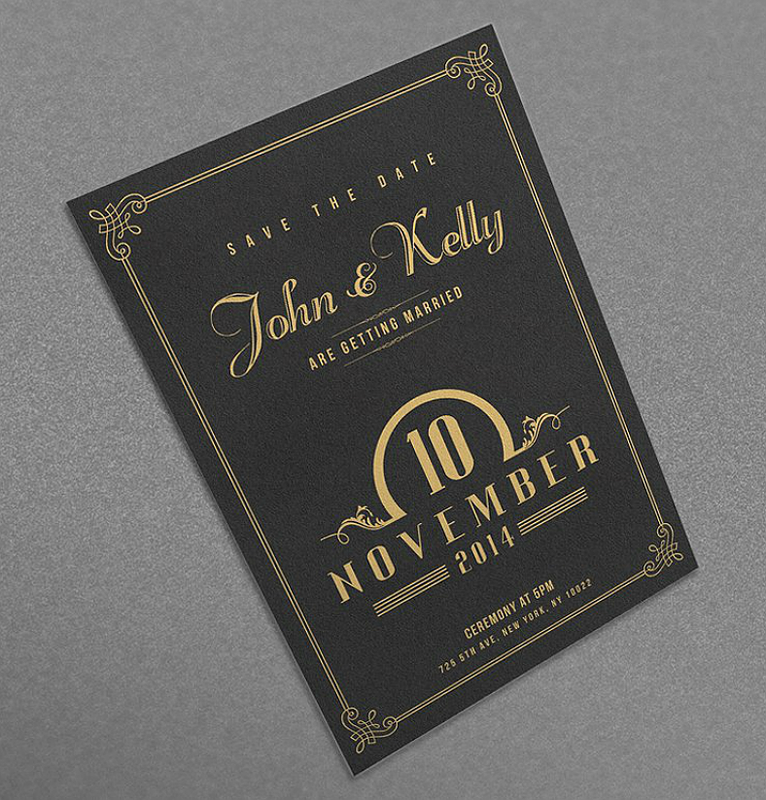 This wedding invitation has a textured black background to contrast from the other vibrant colored features, thus, giving more emphasis to them. 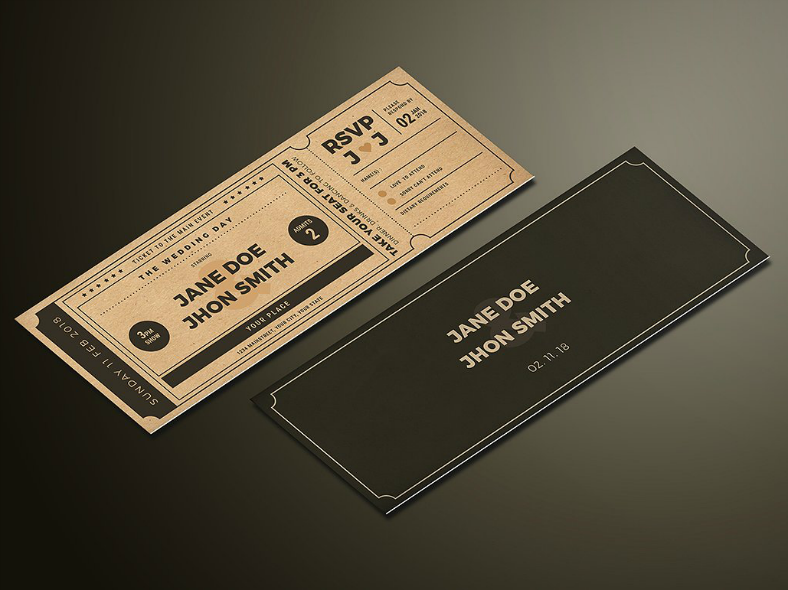 Here is another unconventional wedding invitation design that resembles movie tickets. You can divide this wedding invitation into two separate parts, wherein the left half is where the names of the couple, the schedule, and the venue of the wedding are written. The right half of the invitation—which on real movie tickets are being cut by the user before allowing a moviegoer to enter the theater—is used as the RSVP for the invite to confirm whether or not they will be able to attend the wedding. 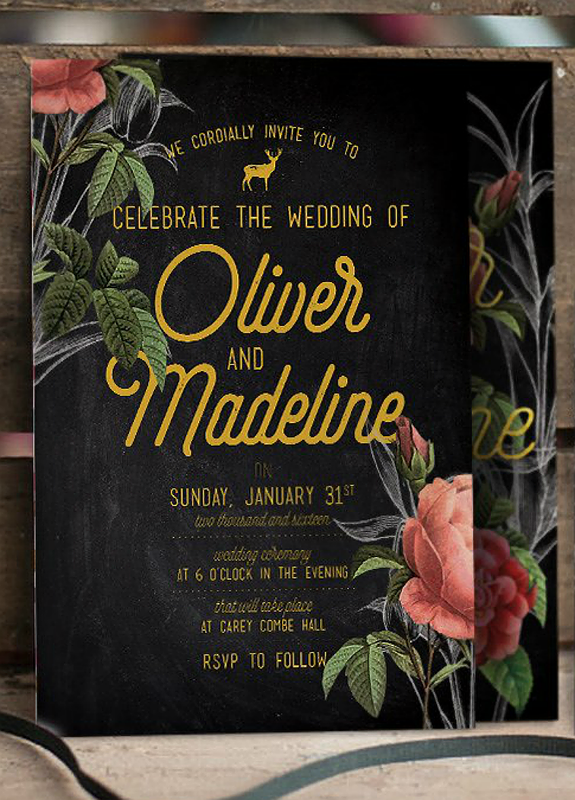 If you want to make use of a Bohemian theme for your wedding invitations, then check out the sample shown above. 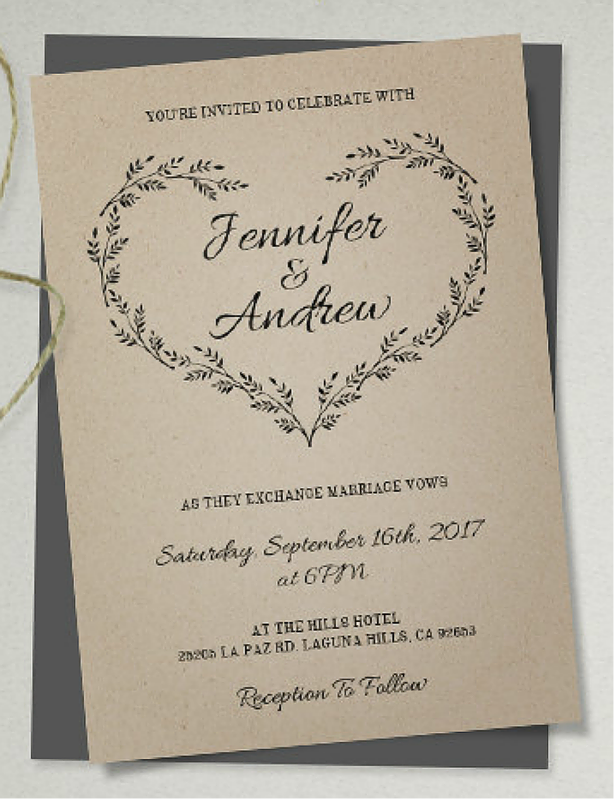 The background on this design gives the entire wedding invitation a rustic feel with the textured brown color. 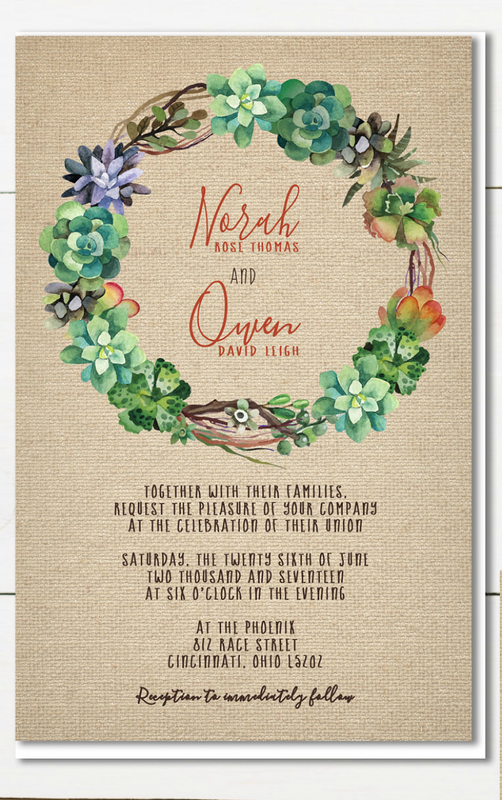 For a more Bohemian look, the text and illustrations added on this wedding invitation design are both hand-paint inspired. 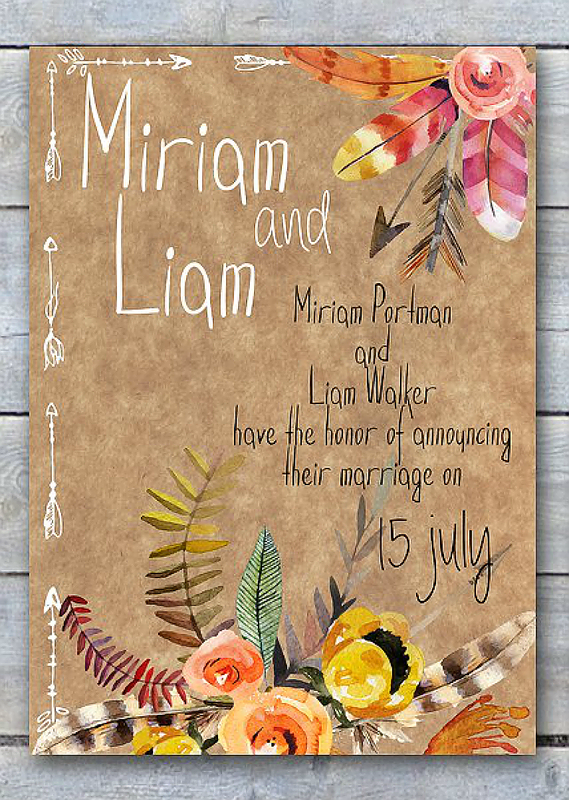 So if you are planning on a Bohemian-themed wedding ceremony, then this invitation design may be perfect for you. 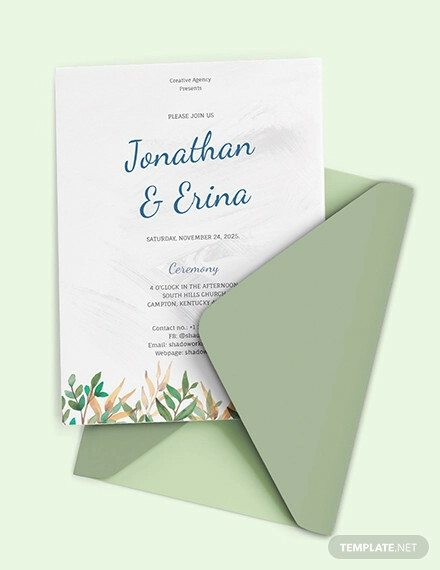 Keep your wedding invitation clean and simple by limiting the number of colors used and also by maximizing the use of white space on the design. 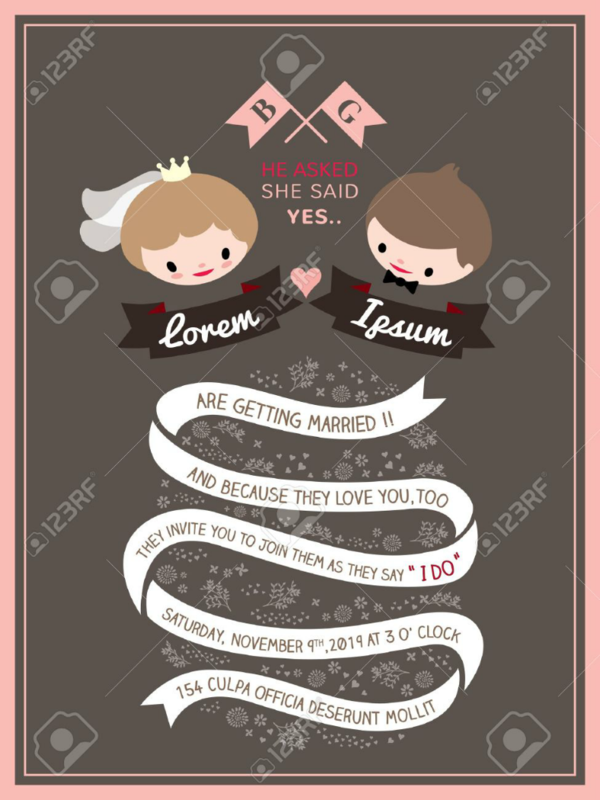 On this wedding invitation, the text are compressed to only occupy the middle column of the design, while adding a decorative ring around the names of the couple to give emphasis to them. Around the sides, there is also a line border with hearts on the corner to keep the design from appearing bare. 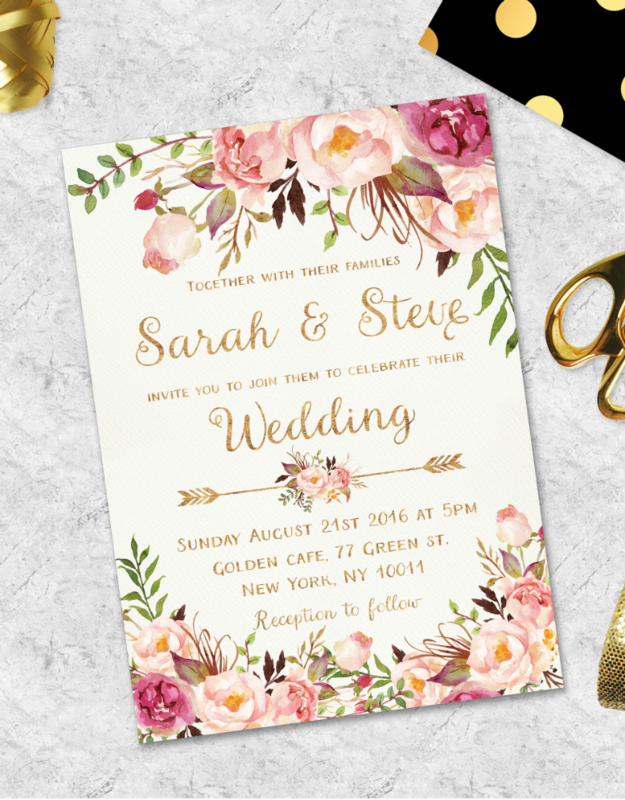 Vintage designs never go out of style, and this vintage wedding invitation is a very good example of a design that is guaranteed not to fail in capturing people’s attentions. As you can see on the sample above, this single design is composed of multiple features that are unique to each other. For example, the outermost edge of the design is a green-and-white stripe that extends from one corner of the design to the other. 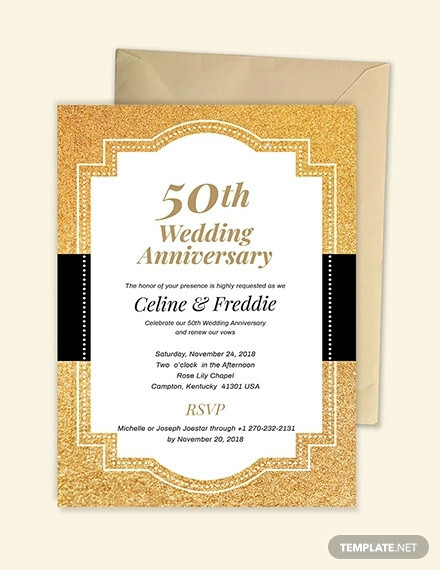 The next feature on this design is the brown frame that surrounds the other relevant features on the invitation, which includes the answers to the who, what, when, and where questions regarding the event. 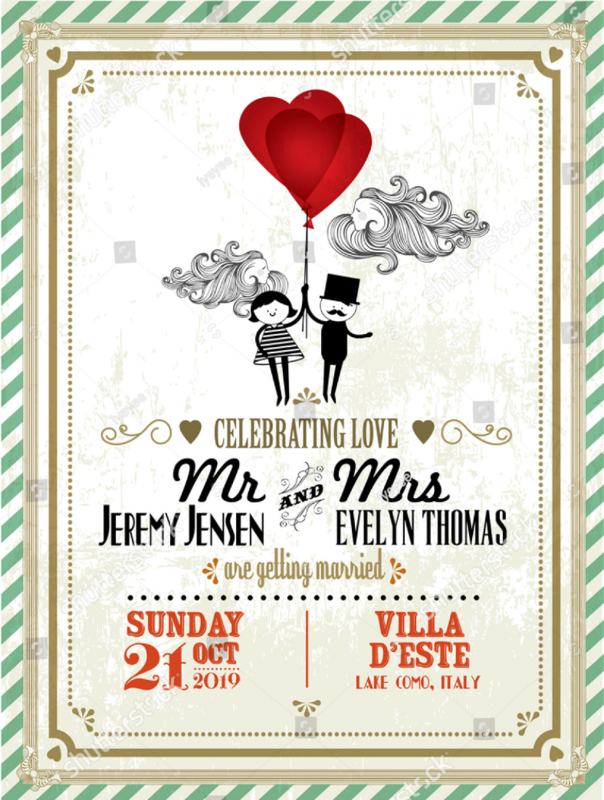 Lastly, on the upper portion of the design, you can also find a caricature illustration of a couple holding on to two heart-shaped balloons and some clouds that also resemble a long-haired person’s head. Why go over the top with the creativity of your design when you can stick to something simpler and cleaner, which can also be easier on the eyes of the reader. This design resembles a glass jar that is being topped with pink flowers, and within the illustration of the jar is where the text is written, which indicates the names of the bride and groom, the date of the wedding, and the venue where the ceremony will be held. Save the date for the wedding of a lifetime and make this memorable celebration worth remembering by making use of an invitation that is also worth sharing. 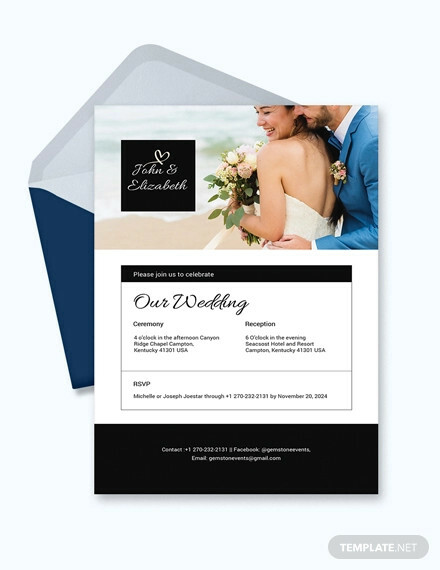 With this formal invitation, it leans more toward simplicity in the design and only focuses on the text, which is far more important to be able to provide the invitee with the information they need about the event. The only feature added to this design that may indicate that this is related to the idea of love and marriage is the presence of a cupid on the upper half of the invitation. Here is another minimalist wedding invitation design that involves a black background with white text and illustrations. 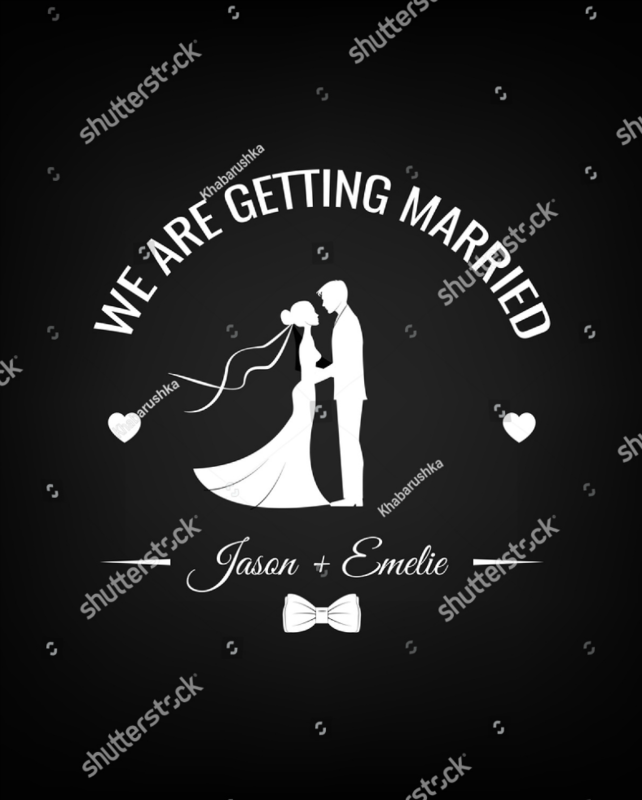 The illustrations on this design is kept to a minimum, showing only the bride and groom with heart symbols on each side. 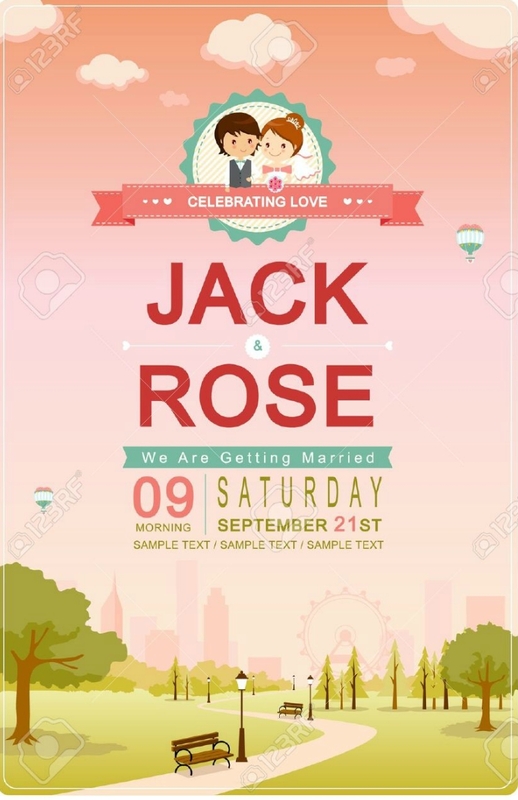 Though the sample image above doesn’t indicate any information other than the names of the couple, this design can still be edited and you may be able to add more elements to it, just make sure not to overdo the adding of the elements to prevent the design from appearing cluttered. 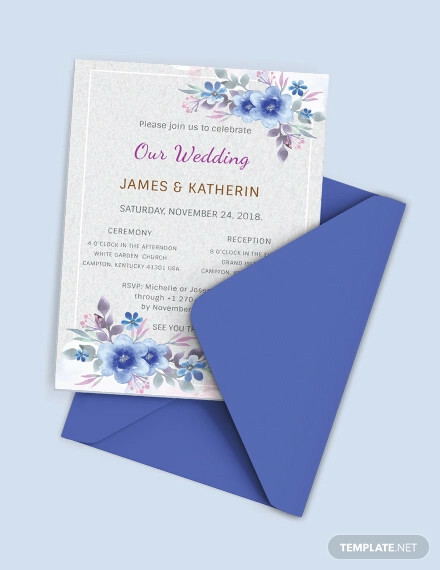 Flowers have long been considered a symbol of expressing love and compassion between couples, which makes it appropriate when included on wedding invitations. 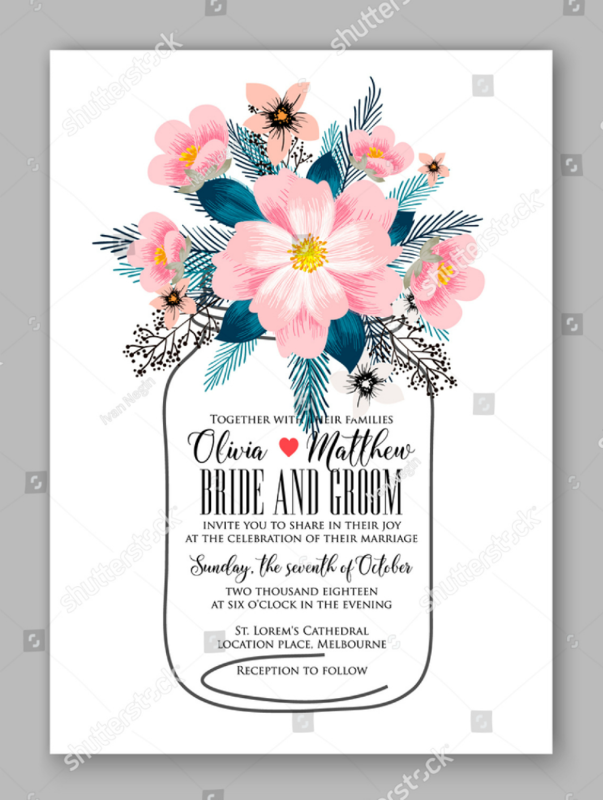 On this floral wedding invitation design, the upper and lower edges are filled with flowers of varying colors, and the middle area is where all the information about the wedding can be found. The passport is a traveler’s requirement when they wish to visit foreign countries, and while there are also countries that require more than just a passport (such as a visa), the common denominator will still lead to passports. 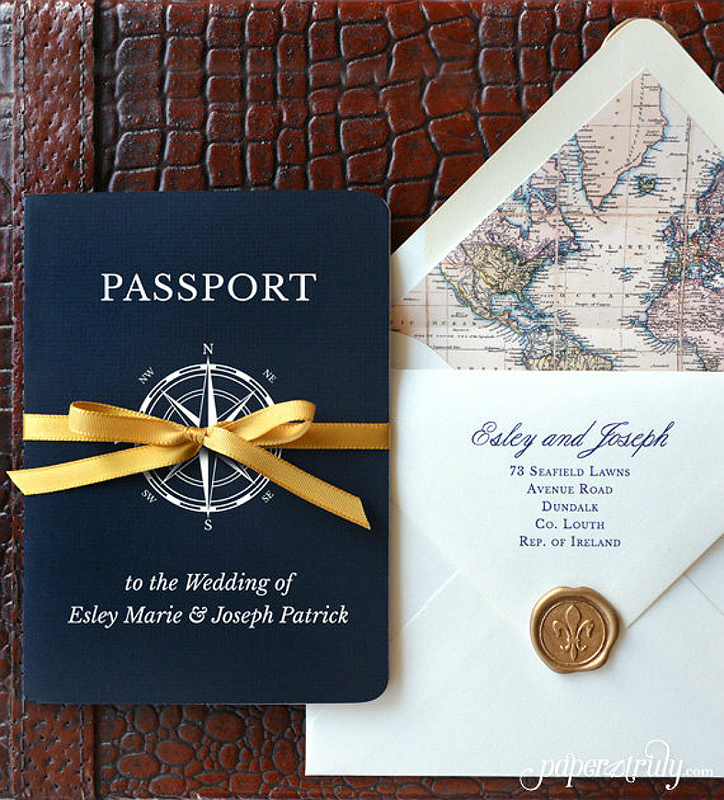 With this event invitation for wedding, it resembles a passport to symbolize the invitee’s requirement to be able to attend the wedding ceremony. So if you want to skip the tradition to make your wedding invitation stand out from the rest, then this design will be the perfect choice. Many people simply love it when a pet is involved in a wedding ceremony, whether on the pictorials or on the ceremony itself. On this wedding invitation, even if you don’t have a pet of your own but still want to include it on the design, you may be able to do so. Since this design is fully editable, you may choose to use other species of animals, both domestic and wild, instead of a dog. 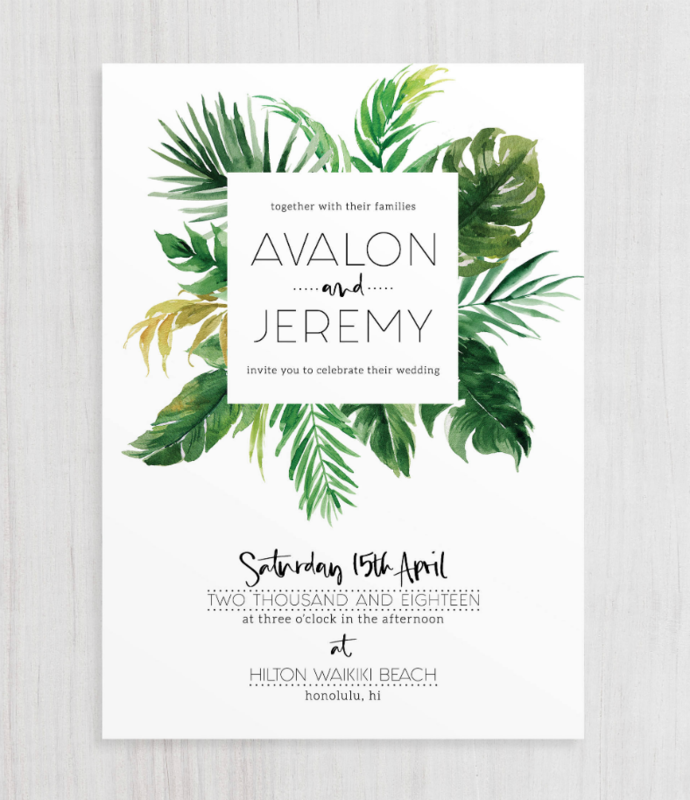 For a tropical feel on your formal invitation, download the design shown above that leans more toward focusing on the text, but also contains illustrations of palm leaves for an added effect. 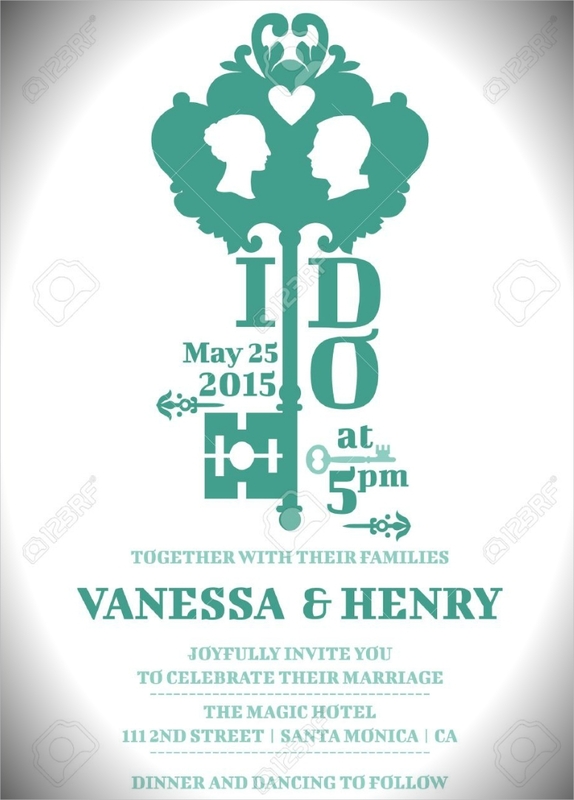 As you can see on the image above, the design seems to have an embossed appearance with the help of another layer where the names of the couple are written. 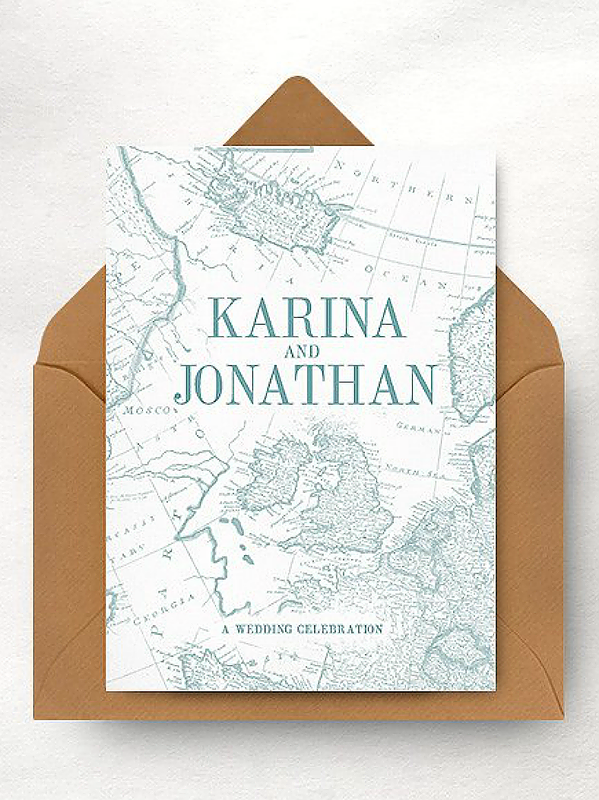 This design maximizes its use of white space to make this wedding invitation neat and easy on the eyes. 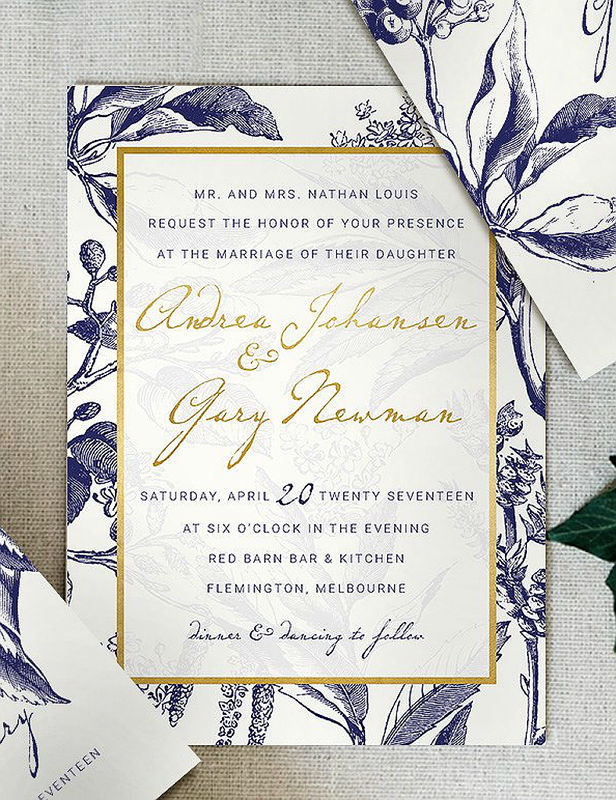 If you want a wedding invitation that appears like it was done on a fabric material, then this might be the one that you’re looking for. The typography on this design is handwritten-inspired to give it a more personalized effect. 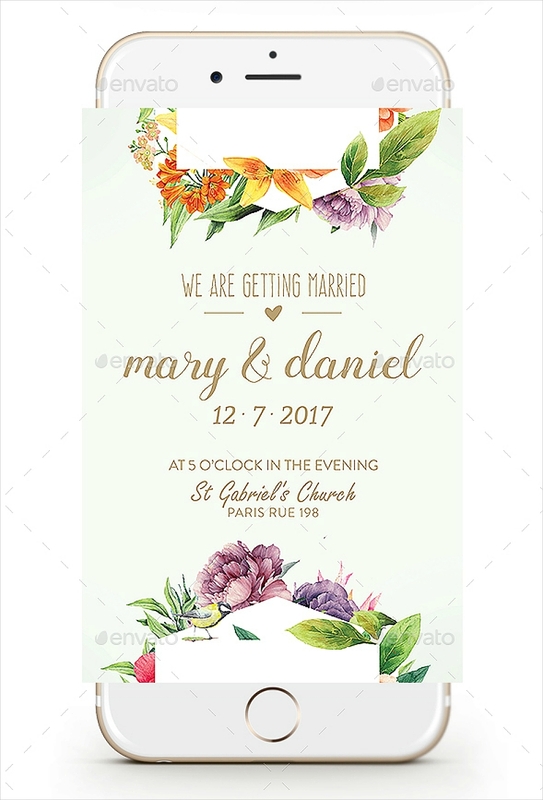 And for further enhancement to this wedding invitation design, the names of the couple are surrounded by floral wreath to resemble the ring that symbolizes their bond. 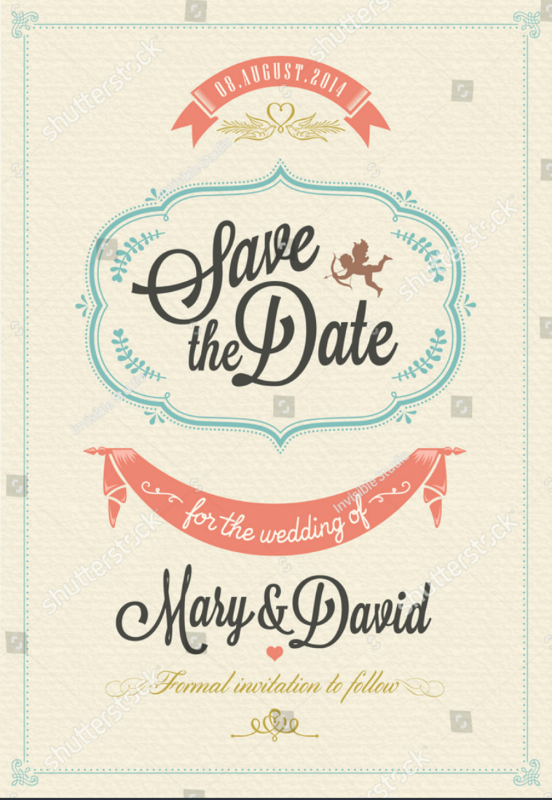 This design contains features that tells a thousand stories about the couple who is getting married. First, you can see that the icon resembles a key, which appropriately fits the saying that the respective partner is responsible in holding the key to the other person’s heart. Within the image of the key are images of the bride and the groom looking at each other with a heart symbol over their heads, and these images are done via negative space on the key bow. Lastly, along the shaft of the key is where you can find the words “I Do,” which resemble the words that are said by the couple when asked if they are going to take each other’s hand in marriage. If you would rather go for a symbolic and creative wedding invitation design, then this one is a very nice choice. 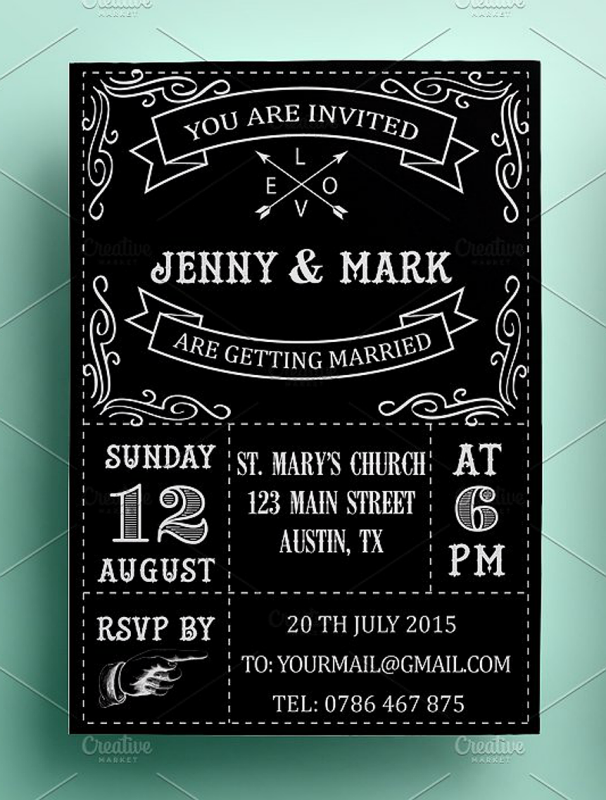 Make your wedding invitation creative by downloading the design shown above. 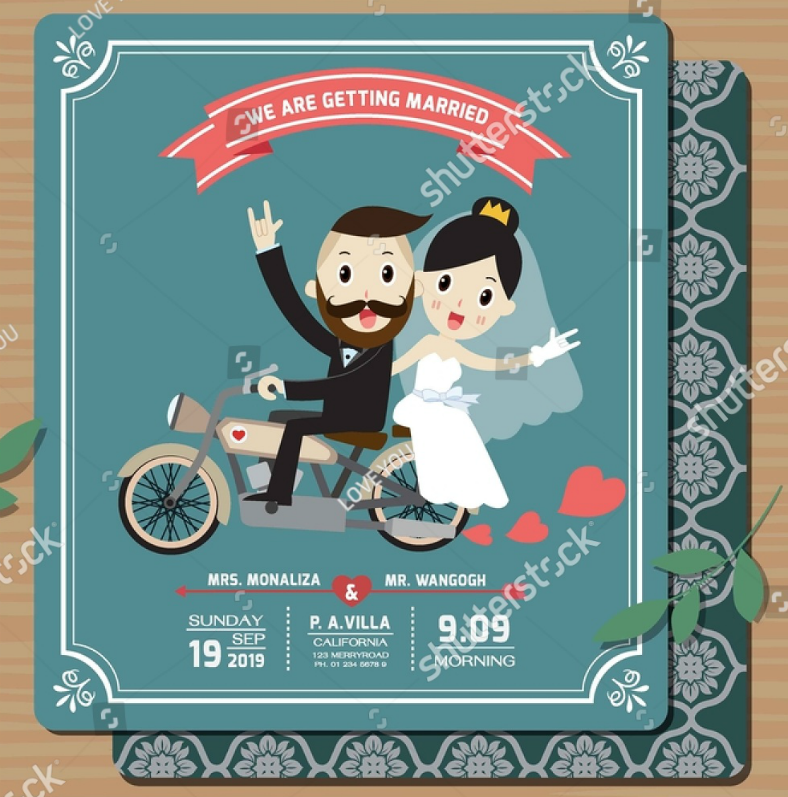 This wedding invitation design shows illustrations of both the bride and the groom on the upper portion of the design, and the details of the ceremony are written below it in a creative manner. As you can see on the image above, the text are being written on a spiraling ribbon, which is divided into five sections to provide you with enough space to write those needed details. 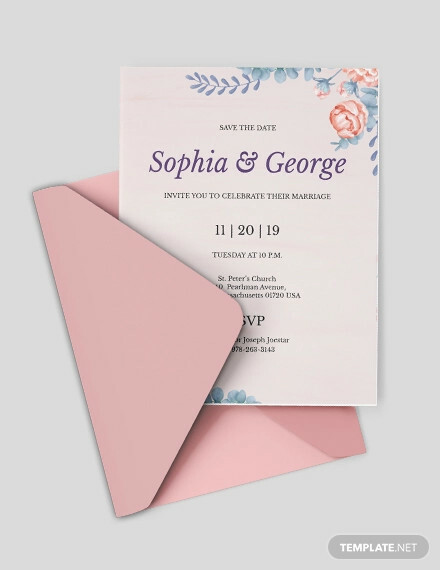 As seen on the designs shown above, these wedding invitations are of high quality since they have all been gathered from among the best ones found on the Internet, and were taken from various reliable websites. These designs were created by highly skillful and imaginative graphic artists from all over the world, who have had a lot of experience working on the said field. 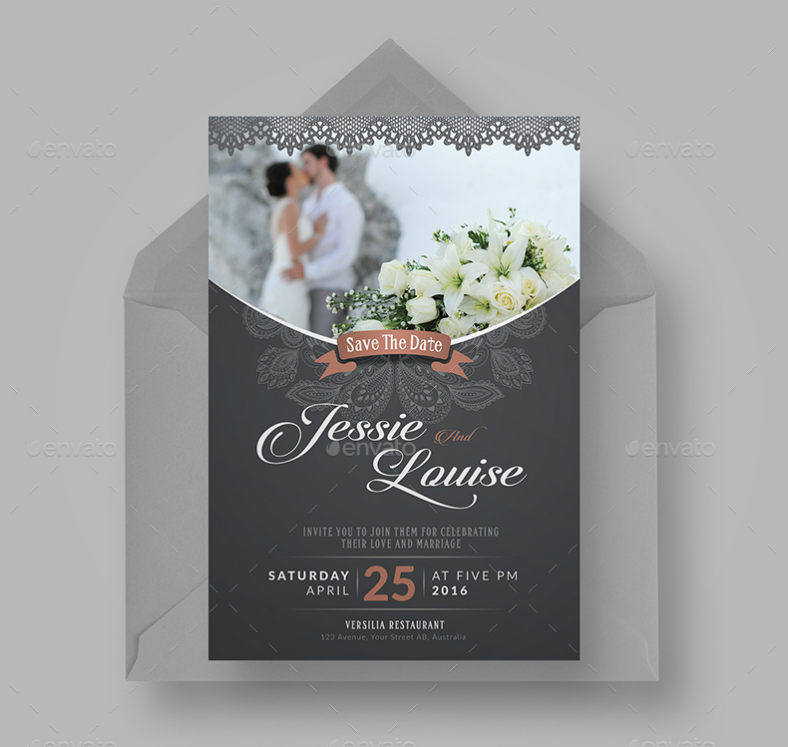 This is to ensure you of the best quality wedding invitation designs that you deserve and worth every penny spent. 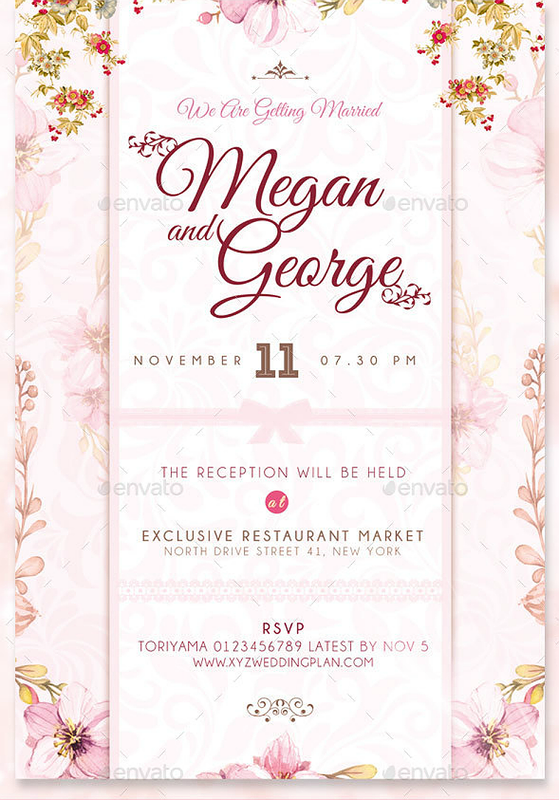 These wedding invitation designs can be downloaded easily, and for a very reasonable fee. 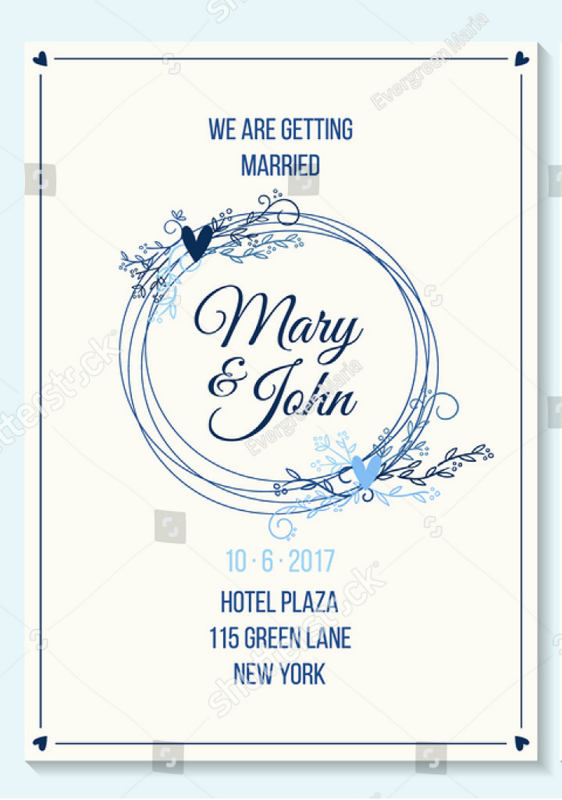 You will simply need to click on the “download/buy now” button to redirect you to the appropriate website, pay the required fee, and you can save the design on to your system wherein you can edit it as you want to be able to come up with the wedding invitation that will suit your preferences. To further help you out, you may even want to refer to our list of the top ten websites for wedding invitations. So what else are you waiting for? 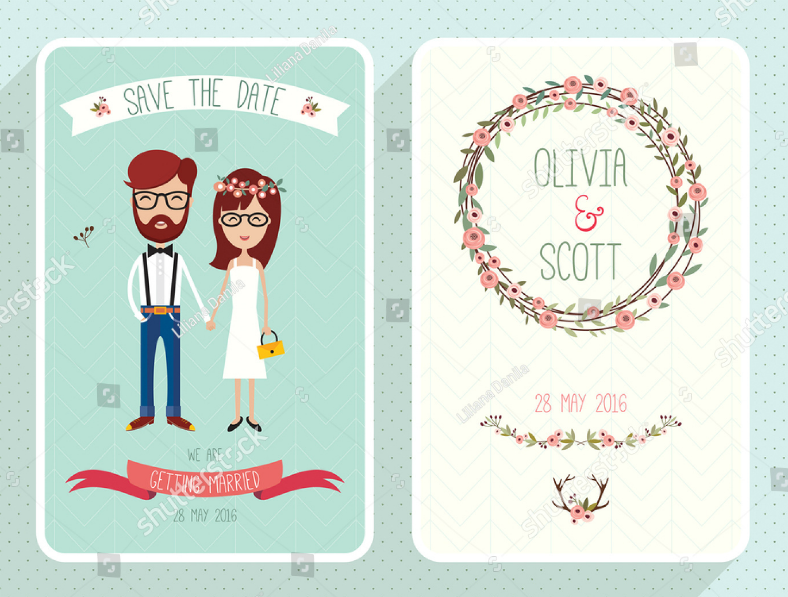 Start downloading a design now so you can also start making your own wedding invitation.